Are you ready to turn over a new leaf this season? January can be a time for refocusing your goals, shaking up your lifestyle, and setting healthy intentions for the year to come. 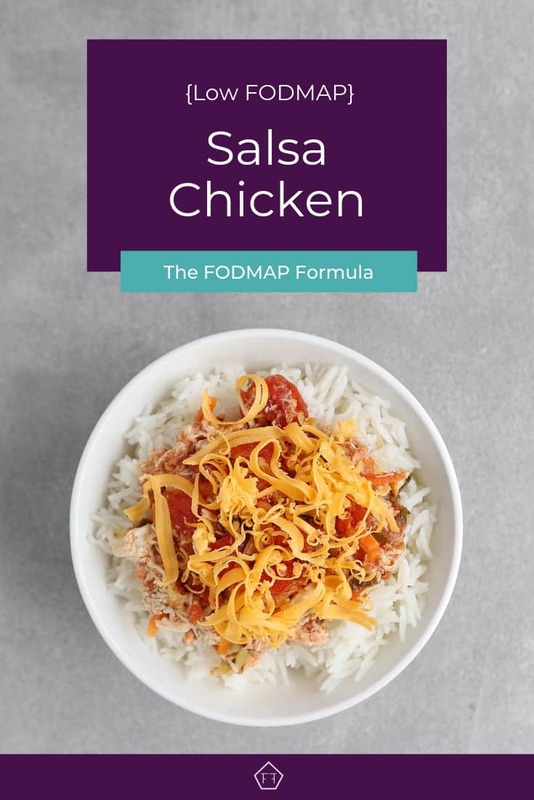 Kick-start the low FODMAP program and make healthy choices with this low FODMAP salsa chicken. This recipe is one of my favourites. Aside from the fact that I can pop it in my slow cooker and forget it, it also has a deep, savoury flavour that’s highly addictive. Packed full of sneaky vegetables, this recipe will fill you up so you can focus on your goals. Think this low FODMAP salsa chicken sounds great, but you don’t have time to try it now? Don’t worry. You can PIN THIS POST for later. This low FODMAP salsa chicken is a great way to sneak some veggies into your diet. Check out the notes below for tips on keeping this recipe FODMAP friendly. 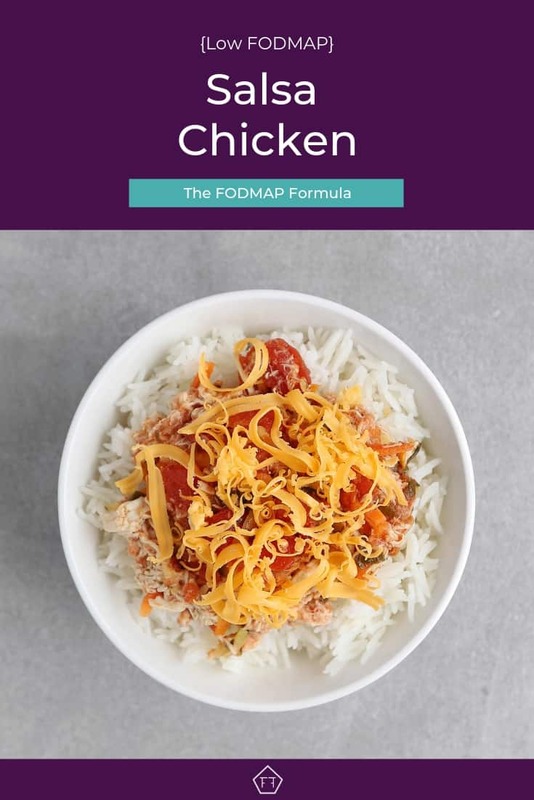 First, because chicken is a protein, it doesn’t have any FODMAPs. This means you can scale this recipe up or down depending on how many people you’re feeding (or how hungry you are) without adding to your FODMAP load. This recipe also uses taco seasoning. Most prepared taco seasonings use onion and garlic powder, so I usually make my own. You can grab my low FODMAP taco seasoning recipe here. Next up is salsa. Finding a low FODMAP salsa can also be pretty hard. Don’t worry, though. You can either use my low FODMAP salsa recipe or you can purchase FODMAP friendly salsa from companies like Fody Foods Co. If you’re using my recipe, don’t worry about letting the salsa rest. Just make sure to give the mixture a good stir so all the ingredients can meet each other before they go in. We also use 1 cup of diced tomatoes. Since my salsa recipe uses Roma tomatoes (which are high FODMAP in servings of 5 small tomatoes or more), I normally use common tomatoes for this ingredient. According to Monash University, common tomatoes don’t have any FODMAPs. So, by switching to common tomatoes, we won’t be adding any extra FODMAPs to the recipe. This recipe also uses carrots and zucchini. According to the Monash app, carrots don’t have any FODMAPs. This means you can eat them freely without adding to your FODMAP load. Zucchini, on the other hand, is safe in servings up to 1/2 a cup. We’re using a 1/2 cup of zucchini for the entire recipe, so it won’t contribute significantly to your FODMAP load. However, servings of 100 g or more are high in the FODMAP fructan. Because of this, I don’t recommend serving this dish on zoodles, as you might exceed the recommended portion size. This low FODMAP salsa chicken gets its zing from a dollop of sour cream. If you are in the elimination phase of the diet, you’ll need to find a lactose-free sour cream. If you can’t find one at your local grocery store, you can skip this ingredient. Don’t worry. The recipe will still be delicious. This recipe is topped off with a handful of cheddar cheese. Just so you know, hard cheeses are low FODMAP in small servings because bacteria break down the lactose during the fermentation process. According to the Monash app, cheddar cheese is safe in servings of 40 g. We use a sprinkle of cheese on each serving. So, you won’t exceed your FODMAP load. If you want more information on dairy products during the elimination phase, check out this article by Monash University. Last but not least, is your base. At my house, we’re die-hard rice fans. The Monash app says 1 cup of cooked rice is low FODMAP. This is normally more than enough for me. This recipe is also great with pasta. If you’re in the elimination phase, you’ll need to use a gluten-free pasta. According to Monash University, gluten-free pasta is safe in servings to 1 cup per sitting. Servings of more than 1.5 cups are high in the FODMAP fructan. So, don’t forget to measure. This recipe is pretty filling, so you won’t need a big side dish to fill yourself up. When we do make a side, I normally choose a nice light salad. If you need some fun low FODMAP salad ideas, you can check out 3 of my favourites here! Want to try this low FODMAP salsa chicken? Don’t forget to PIN THIS RECIPE for later. Looking for a warm and hearty FODMAP friendly dinner idea? Try this low FODMAP salsa chicken! Pop the ingredients in your slow cooker before you head to work and come home to a delicious low FODMAP meal! Place your chicken in the bottom of the slow cooker. Sprinkle taco seasoning over chicken. Cover with vegetables and salsa. Pour water over vegetables. Cook on low for 6-8 hours. Remove chicken breasts from slow cooker and shred in a large bowl using two forks. Once shredded, spoon the vegetables and liquid from the slow cooker into the bowl and mix. Add the sour cream and stir to coat. 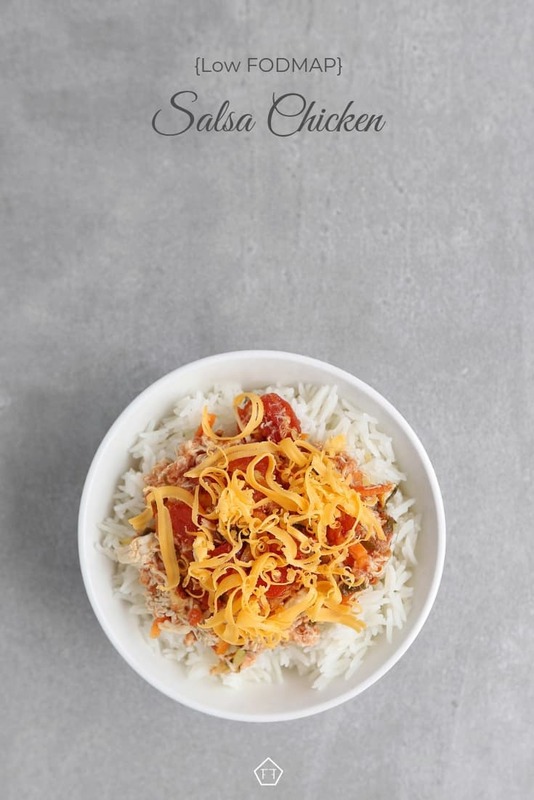 Serve with rice or gluten-free pasta and top with a sprinkle of cheddar cheese. Serve warm. This low FODMAP salsa chicken will get your year off to the right start. If you like this recipe, sign up for my mailing list below. You’ll get new recipes and articles delivered right to your inbox.